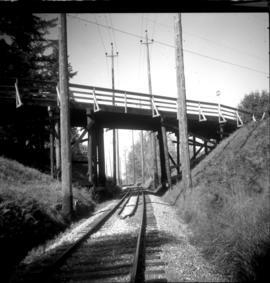 Photograph taken at the overpass bridge on the BC Hydro Railway, close to the intersection of County Line Road and Howell or 64th Avenue. 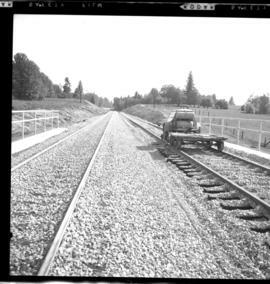 Photograph depicts part of the new 2 1/2 mile railway that was built to connect the CPR main line just east of Fort Langley with existing BCER trackage found on Living Stone Road. 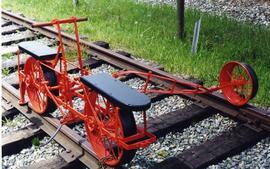 Trackage was not in operational use. 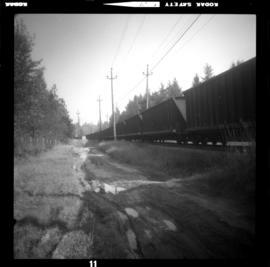 Photograph depicts a CPR unit coal train travelling empty and eastwards. 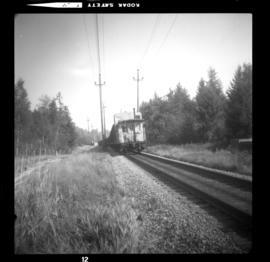 Taken at the Livingstone Road grade crossing, near Freeway 401. 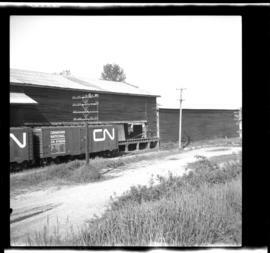 Photograph depicts a CN stock car with a second loading train in position. 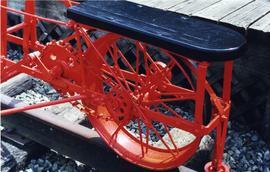 The stock car was built iin 1931 and on the side of it states: "Return to Eckville." 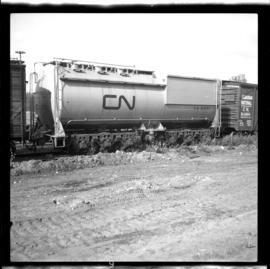 Photograph depicts a water tank car, #80097. The top view, from the rear end shows 6 filling holes (3 pairs) covered by wood foot boards and an empty coal bunker can be seen beyond. 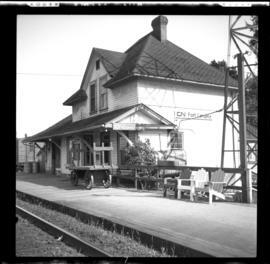 Photograph depicts the passenger station in Fort Langley. Davies notes that one of the rooms in the station used to be a communications office. The rest of the of the building was disused and some rooms were in shambles. 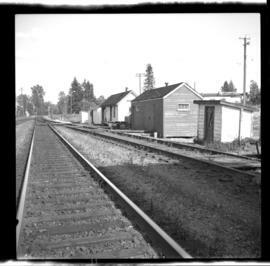 Photograph depicts a private spur that lead to a sawmill on the north side of the station in Fort Langley. Photograph taken looking eastward, down the main line at the eastern end of the station in Langley. 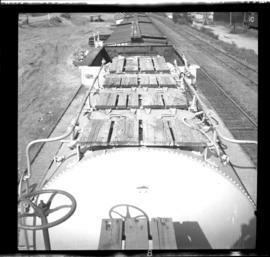 Photograph depicts a water tank car, #80097. 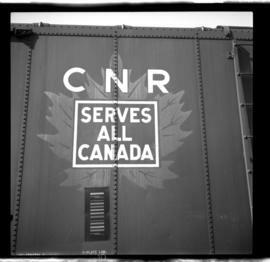 Photograph depicts a slowly-disappearing, older CN logo. Davies notes that he saw it infrequently in 1970, but it was still not yet rare. 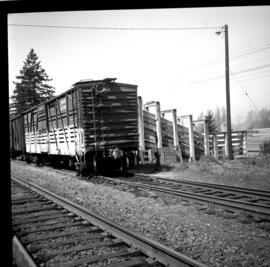 This was a good example of a box car at Fort Langley. Photograph depicts a pepper pot burner that was becoming a rare sight in metro Vancouver because of pollution laws. 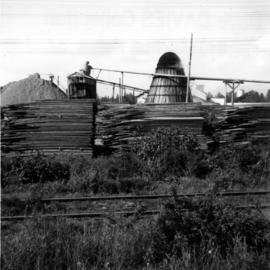 The sawmill was between the north side of the CNR station and south arm of the Fraser River. 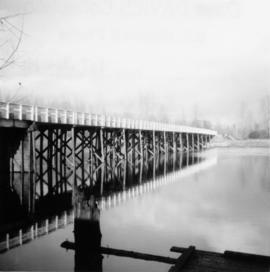 Photograph depicts a road bridge that led from Fort Langley to a ferry slip on an island. 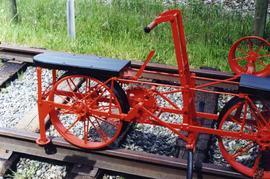 Photograph depicts a velocipede outside the museum depot in Fort Langley.